The Dogpatch neighborhood is a fun, budding food destination in San Francisco. The Chocolate Lab, Serpentine, Mr. and Mrs. Miscellaneous, and Just For You are just a few of the fun neighboring places to grab a bite to eat in this up-and-coming neighborhood. Taking advantage of an especially warm San Francisco day I galavanted over to Piccino with my neighbor and fellow foodie friend. At newly remodeled location, just down the street from where they first opened, the space is flooded with natural lighting. The canary yellow wall paint imbues a warm and inviting feeling for all those that come in. Red onions the size of a miniature soccer ball decorate the elegant, long wooden tables. We shared an anchovy, little-gem salad, a recipe from the Italian city of Treviso, with anchovies, padron peppers, and parmesan. This seemingly simple salad had a lot of colors and flavors. The delicate fried anchovies that rest on top of the salad in their full figure but vacillated between buttery and crunchy textures while eating. Finally, we had to order a pizza because Piccino is known for their Italian, thin-crust, seasonal pizzas. 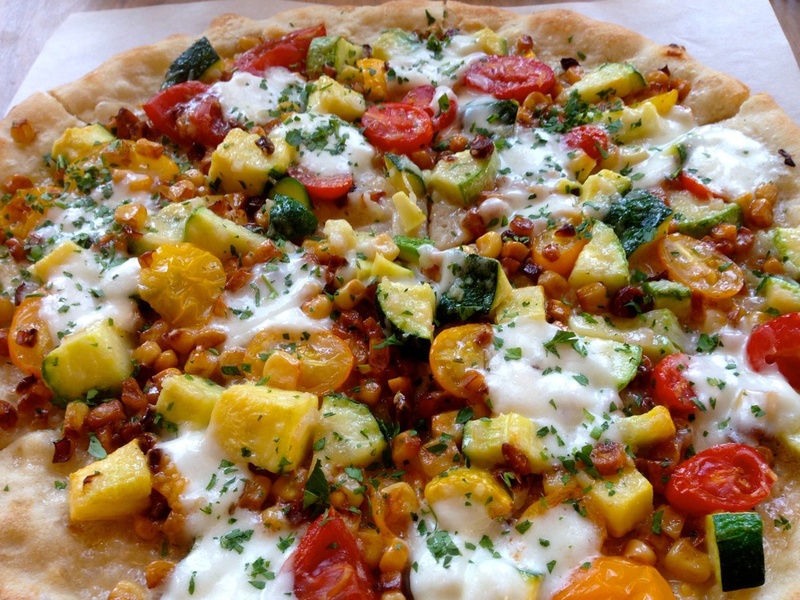 Light on the sauce, but heavy on the summer-toppings, our pizza was jazzed up with squash, corn, cherry tomatoes, and generous portions of mozzarella di buffalo. Using simple recipes to let the fresh, local ingredients shine, Piccino has won me over.